So you have a new adult piano student – great! But what did you do in a first lesson? It’s a bit different from having a young, beginner student, who might be happy with some games and fun tasks. Teaching an adult can certainly be fun, but of course, you need to take a different approach. 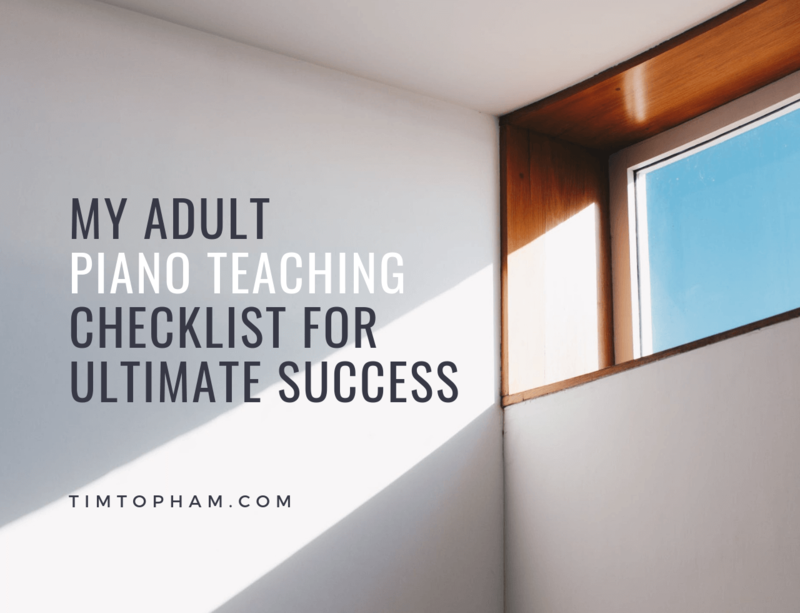 In today’s blog post, I will tell you exactly what to do in your first piano lesson with an adult piano student, and you can download my adult teaching checklist to refer to. For today’s blog post, I have also asked some of my Inner Circle members to share their top adult piano teaching tips! You’ll walk away after reading this with plenty of ideas! Read the full post to download my First Adult Lesson Checklist for free. There are a few basic things you need to do in your first lesson with a new adult piano student. Here’s a quick overview (I expand in my first adult lesson checklist, which you can download below!). Tell them how much you are looking forward to seeing them for the next lesson! 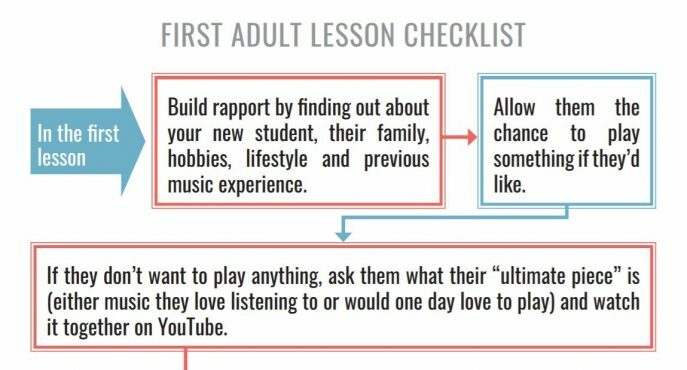 There’s a lot more to it, and that’s why I have put it all into a two-page handout featuring a list of do’s and do not’s for your first lesson with an adult student. Adult students often have a lot of things going on in their lives. I asked members of my Inner Circle what they do in their first lesson with an adult piano student. Marcy Davis says she likes to start with an interview. I want the student to get a taste of the kind of music activities I use for beginners, but I also want them to get a sense that piano study is not as scary or hard as they might imagine. For those with prior music study, we might talk about the similarities and differences between the piano and their previous instrument. If they express an interest in a certain type of music, I pull out examples from my own library. When we teach adult students, we might think that note learning and reading might be easier for them to pick up, compared to a young beginner. Marcy says that isn’t always the case, and it’s important never to underestimate or overestimate a student. At the beginning my biggest mistake was underestimating just how difficult note reading can be for the adult student. For students who are encountering notes on the staff for the very first time, the challenge can be intense and sometimes insurmountable. At the time I had little to no rote activities to draw on, only staff reading books. These students would work incredibly hard to translate what they saw on the page to the correct keys and finger movements, but the result was anything but musical, and generally left them feeling frustrated and incapable. ‘Real music’ was definitely not happening. The experience sent me on a search for better learning materials for adults and also to create some of my own. Karen markets to adults in a different way than to parents, with a special page on her website. She suits her hours to adults with teaching times on weekends, and is able to generate new students through her website. Adults have different piano teaching needs to children. She says the biggest difference between teaching children and adults is that adults often want to have some options, and ask a lot more questions. Expect adults to come to you with something they heard/learnt or tried to work out theory wise – they will do this way more than kids. They can also at times get frustrated more easily than a child, get a little annoyed at themselves for playing better at home, get overwhelmed by life’s busyness and not always get as much practice in as they or I would like. They really like to choose own repertoire- sometimes this can be a challenge when they are choosing pieces in a book they have purchased that they aren’t ready for. I like to set goals and remind them to be kind to themselves when life gets in the way. Every now and then I will give them something beneath their learning level so they have a quick win and can play something they like. For those struggling a bit with reading I find technical work helps – as they feel they can master that and it helps with their hand position etc. And what about some key mistakes to avoid? Don’t be afraid to have the conversation on lesson frequency – fortnightly lessons can work well for some adults who feel they don’t have enough time between lessons and then think they are letting their teacher down. Talk to them and keep talking to them about the importance of counting and why – many think they can play without it and then wonder why they don’t sound musical. Avoid kids’ books – don’t go there! Make sure they have an instrument to play on- if they invest in a cheap keyboard they will eventually grow out of it. 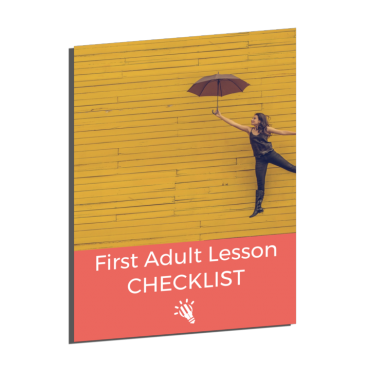 Scroll down below to download my First Adult Lesson Checklist. Andrew is a top blogger in the music teaching world; he is a big part of our friends at MusicalU and often writes for my blog too! He says right from the first lesson, you need to get adult students dreaming. I wave a magic pencil around and ask, “If you could play anything you ever wanted on the piano right this second, what would it be?” Sometimes it takes a little prying to help them to admit what they really want. After that, I do my best to take a big obvious step in the direction of their wildest dreams. For example, if they want to play Für Elise, we start right then and there on the main theme, learning by graphic patterns and by rote. If they want to play a certain pop song, we look up a YouTube tutorial and grab the signature lick. If they want to sing and play or jam with others, we start learning chords. Andrew says having adult students playing as quickly as possible is important, and therefore sometimes doesn’t worry about method books. Method books often make them jump through unnecessary hoops. 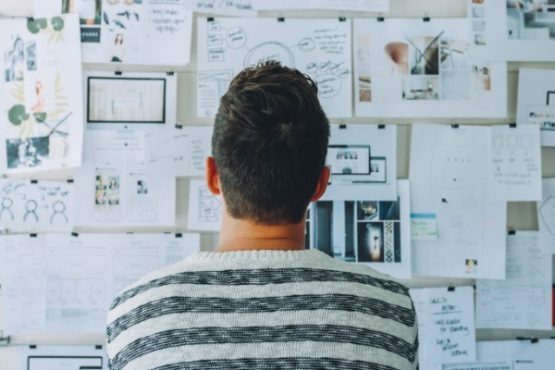 Working with my years of experience and with the student’s own reasoning, we often come up with creative hacks and shortcuts that are idiosyncratic to the student’s special way of learning. If something is not working, there is always an alternative way of doing the task or looking at it or approaching it that will work better. When it comes to teaching adults compared to children, Andrew acknowledges there can be some challenging differences. Adults have two things that children don’t: baggage and reasoning. Early wins are crucial to quash the expectations of tedious drudgery associated with traditional piano lessons, and the self-criticalness. Adult reasoning is a powerful tool for progress. Adults typically have more disciplined minds and are more able to choose and follow through on their choices. Making a respectful space that allows them to express their own creative authority engages adult students and they become more invested in their own learning process. The biggest mistake I made with adult students was to encourage them to play recitals. No matter how well they did, I never saw them again. I realized that was because I was not respecting their musical goals, which were mostly for personal enjoyment. A child’s learning is to learn to respect the teacher’s authority because it helps them respect their own inner adult authority as they grow. Adults come with their own authority, and it must be respected. Yet often they come to us with childhood baggage about teachers being disappointed in them. When life happens and they are not able to practice as much, or duty calls them to another way of spending their time, it’s important to express adult compassion and empathy and not become attached. 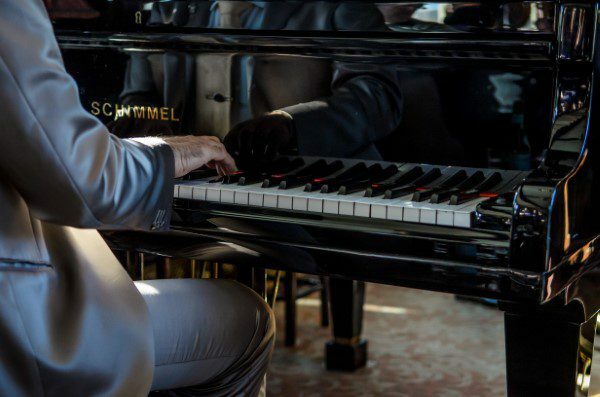 When they are concerned that they aren’t able to practice enough, we can help them create a space where that is okay and they can still enjoy their piano learning on a more modest level, or accept if it’s time to let go. Okay, so you’ve read all of these tips and tricks, and now it’s time, as promised, for my free download. This is a checklist/flow chart to help you navigate the first lesson with an adult student. There is also a list of do’s and do not’s on the second page. Print it out and have it handy for when you get a new adult student! 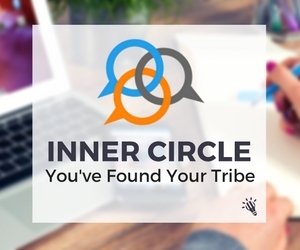 Inner Circle members, you can find this handout and plenty of other adult teaching resources in the Resource Library. What do you do in your first lesson with an adult student? Let me know below!